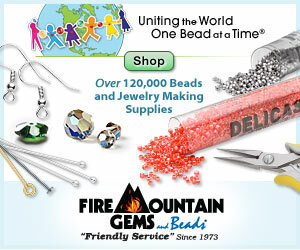 When making jewelry, choosing the right bead colors and finishes is an important part of the design process. But once those selections have been made, there is one more step to creating a piece of jewelry that pleases the eye. The colors have to be combined in the right proportions, and used in a way that allows them to complement each other. We don’t often have to think about this step, because when the colors are already harmonious, they can guide our creativity in the right direction. It’s when color palettes challenge the norm that proportions and placement become essential. This week I am working on a few different pieces for various fundraising events and campaigns, and I nearly had a color disaster. I wanted to share the mishap, and show how a few simple tweaks can change a design from scary to sensational. The piece I am working on started with a pink tagua slice - the last one in my stash. I wanted to keep it simple, so I planned to make a caged bead (or reverse daisy chain) pendant. Just like my Beach Rubble necklace, I had to use some flat beads to cap the tagua slice, because the holes are too large to cover with seed beads. As I was gathering up the various components, I came across these little mother of pearl tabs with painted flowers on them. I picked them up at a sale ages ago, and have been waiting for an idea that would make good use of them. I thought the tagua slice would look so cute dressed up with a little orange flower. I tested out lots of different seed bead colors for the palette, and finally decided on salmon pink, transparent orange, and transparent jade. The centers of the flower are a deep reddish brown, so I scooped up the last of my chocolate pearls to balance the shell pendant. I almost grabbed some bright orange shell coins as well, but they clashed horribly with the dark orange seed beads. For the caged beads, I chose pink cat eye rounds. As soon as I had made one section of my bead chain, I knew I had made a mistake. My first reaction to this palette in use was “Yuck!”. There was no way I could present this to the fundraiser. I had to make some changes. I’m fully aware that this palette already teeters on the edge of obscene, so I had to tread carefully. I couldn’t add any more beads or colors, and I didn’t want to take anything away. I looked over the failed chain again, and decided to try putting the orange seed beads in the background. I had to let go of my notion that caged beads have to be done in two different colors, but I was willing to try anything to make this necklace work. So, I frogged my original stitches and started over, this time stringing with orange, and embellishing the cat eyes with pink. The new chain is so much prettier! It’s still a little brazen, and I like that about it. I’ll be finished this pendant and a ring to match by this weekend. I hope it can find its owner and help out a good cause. It's amazing what a difference it made just changing the placement of the beads. A good lesson for me. It's really beautiful! I love the pink and brown and this is such a sweet piece! Froggy stitching is a necessary evil for seed beaders...YUCK! I have a terrible confession to make: I almost never rip apart or undo beading mistakes. If there's any actual ripping or cutting required, and I've only used one length of thread, I'll usually just toss the mishap into a container of UFO's. I'm saving them for a rainy day! At some point, I'll be able to go through and re-discover bead colors and perhaps upcycle them. It's like my little beading time-capsule.